Whether they were novices or yogis, one thing was certain: none of the participants at the Moose seat holder yoga event had ever downward dog-ed with a moose before! Mick E. Moose demonstrated how limber he was as he followed along with Heather and her crew from The Yoga Barre Winnipeg, who led a beginner yoga class for around 75 Moose seat holders on event level of Bell MTS Place in late August. Moose Yoga Night is just one of many exclusive perks that come with being a Moose seat holder and these unique experiences are piquing fans’ interest. Season seat holder Patricia Chaychuk thought there was no better place to take her first yoga class than at the home of the Manitoba Moose and Winnipeg Jets. A Jets and Moose season seat holder since the return of both 2.0 teams, Chaychuk took a spot in the front row and gave it a go. A few rows behind her were Maureen Morrice and her seat mate who are experienced in yoga but are first time mini pack holders for 2018-19. After taking in between five and eight games per season for the past several years, these self-professed “super hockey fans” decided to secure their favourite Moose games as seat holders and take advantage of the little extras. Being in the arena and talking hockey has gotten Morrice excited about the upcoming season and she looks forward to seeing the continued development of the future Jets stars and how the new players fit in. “It’s a whole different atmosphere from the Jets and it’s nice to have that because you’re seeing a lot of those players that will eventually move up. It’s really very cool and I can’t wait for it now,” said Morrice. Chaychuk also shared her enthusiasm for the potential of the season ahead and is glad to be along for the ride as the Moose build on their momentum from last season. “I’m excited to see the up and comers and hope for them to make the big team,” said Chaychuk, who last year enjoyed watching the progress of Brendan Lemieux, Mason Appleton, and Sami Niku. Among Chaychuk’s favourite games are the traditional New Year’s Eve game and the Star Wars game, where the costumes are always fun to see. Chaychuk will also be sure to spread the warmth of Winnipeggers to the Moose players at the Autograph Alley sessions that are held after select Moose games throughout the season. 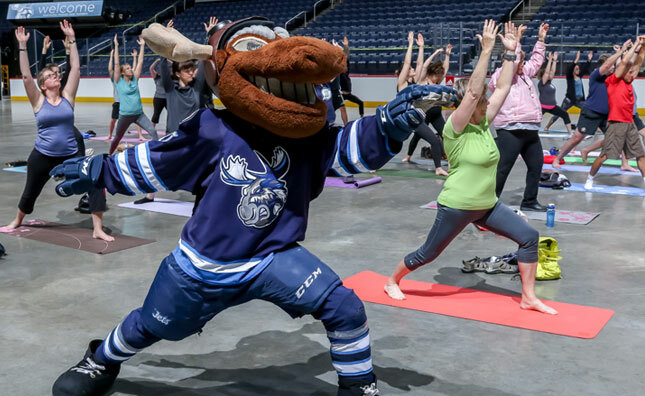 Perhaps the Moose yoga event could be considered the calm before the hockey storm, and if it’s a wild ride, Moose fans may need another yoga session down the road.